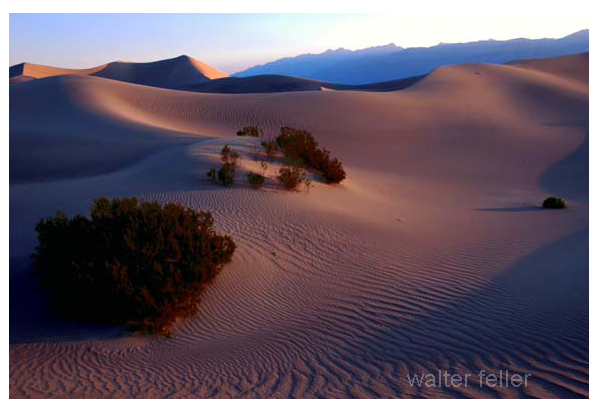 Sand dunes form wherever environmental conditions provide sand, steady wind and a location for the sand to collect. This may occur in both coastal and terrestrial settings. Sand starts as bedrock, which is broken down into blocks, a size at which water is able to transport them downstream. Eventually these large blocks may be jostled around enough to be broken into sand-sized grains. Sand and other sediment usually ends up deposited along the sides of streams, in lakes, or in the ocean, but what happens when it doesn't? An ephemeral, or seasonal stream, during its dry periods, is exposed to wind. Occassionally a lake will dry up, with its sediment left without the protection of water. These two sources feed land-locked dune fields. Sand dunes in Mojave National Preserve near Kelso, Ca. ... is a 1.5 square mile complex star sand dune that reaches 2,731 feet above sea level.